In the first part of this great series on sustainable building and green living, we introduced the components of sustainable design such as thermal comfort, energy efficiency and water efficiency. We are now going to move this forward by looking at what you can do to your current home to improve its sustainability and reduce any negative effects on the environment. Running through this will be ways to also improve your standard of living. One of the biggest potential sources of energy waste is windows. Heat can escape when the outside temperature is cooler than the inside temperature. Obversely, heat can be absorbed internally through windows when the outside temperature is hotter than inside, especially in direct sunlight. Windows in Australia are compared for efficiency by the use of the U value (or Uw for windows). This value measures how readily a window conducts heat. The lower the value the more efficient the windows is at insulating against non-solar heat loss or gain. The installation of double glazing to east, west and south facing windows. Relocating east or west facing windows. Reducing the size of east or west facing windows – doing so, however, will reduce some of the natural daylight in your house. Putting tinted films on east or west facing windows. The correct sizing of eaves and/ or pergolas to north facing windows. The use of external shading such as awnings and shade cloths (more effective against direct sun heat gain than double glazing). Careful placement of deciduous trees; ensure they are not too close to your house and take into account future growth and potential root zone building damage. Installation of draft stopping devices to windows, doors, chimneys etc. During winter it’s also important to generate and contain heat within your home. In this case, you may want to consider the use of single glazed north facing windows (providing they are correctly shaded against summer sun) to reflect in the winter sun. Thermal mass is the ability of a material to absorb and store heat energy. The longer it takes to heat a material up the higher its defined thermal mass. If thermal mass is used correctly it can moderate your home temperature and can both increase your thermal comfort and significantly decrease you energy bills. Poor use of thermal mass can cause discomfort, like those nights in summer where your home is radiating heat causing sleepless nights. In summer the use of thermal mass and good ventilation can reduce heat in the home. If your home is made of a lightweight construction (light brick, timber floors) and thermal mass is low then external insulation combined with careful ventilation will also reduce the amount of heat entering the house. In winter you want to use materials that can store heat and dissipate it evenly through your home. Getting the right balance of thermal mass is climate critical. So, if you are building and extending make sure you are talking to a builder who understands sustainable design. Sustainable design starts from day one of the concept design. Ventilation refers to the exchange of indoor and outdoor air. Having good ventilation in your home will ensure that you have a clean fresh environment free from indoor pollutants as well as improved thermal comfort, particularly in the hot summer months. In the winter months, it is still important to have fresh air flowing through from outside. This has to be balanced with preventing heat loss. Good placement of doors to allow draft flow. Use of ceiling fans or whole house fans. Fitting fully openable windows, including breeze catching windows. Removal of any external plants that may be blocking breezes from entering the home. Use of geothermal or conditioned mechanical ventilation. Insulation provides a barrier to heat flow which will keep your home warm in winter and cool in summer. A well-insulated home can save you up to 50% of your heating and cooling bills, as well as reducing your carbon footprint. Seal any gaps that may cause drafts, especially around doors and windows. It can be difficult to achieve a high standard. Block chimneys and wall vents during colder weather (ensure that you still have air flow through your home though). Add insulation to accessible walls, floors or roof sections. Insulation comes in the form of bulk and reflective. Bulk insulation is concerned with resisting the loss of heat whereas reflective insulation is used to reflect heat away from your home. Use carpets and rugs on timber floors. Insulate from under your house with reflective foil (be aware of the dangers electrical cables pose to such installations). Use heavy curtains or well fitting blinds with pelmets (can be more effective than a double glazed window when used correctly). 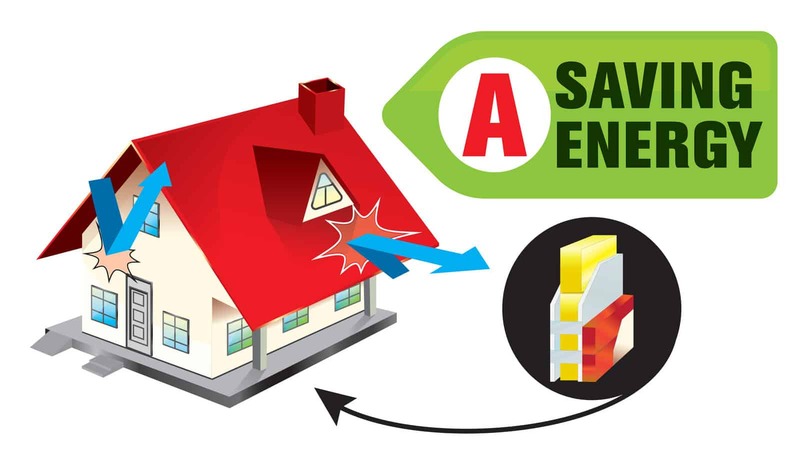 There are many things you can easily do to make your home more energy efficient. Energy consumption mainly comes from the appliances you use, the fuel you burn and the lighting you use to light your home when natural light is low. Using less energy will save you money and take the pressure off suppliers, keeping their energy prices lower. You will also reduce your carbon footprint. More importantly, an energy efficient home is also a comfortable home. Upgrade your heating and cooling system to an affordable high energy star rating one. Improve natural daylight into your home by removing any outdoor vegetation that might be blocking it. Use energy efficient lighting. For example, replace any low-efficiency lighting with LED or similarly efficient lighting. Use high star rating appliances e.g. washing machine, fridge, entertainment system. Run as many appliances on gas as possible (a cheaper and low carbon producing energy source). Avoid electric heating and hot water units. Continuous gas hot water units only produce as much hot water as is required at any one time. Cooking with gas is more efficient and instantaneous than electric (also better to cook with). As mentioned in part 1 of this series conserving water is concerned with how to reduce the amount of water waste. One way to reduce waste is to recycle water with a greywater system. These systems re-use water that would otherwise be lost e.g. shower and washing water. These systems are high maintenance and can be costly. In Melbourne, it is more common to collect stormwater which is used to flush toilets, wash cars or water gardens. Although not as high maintenance as greywater systems there is a degree of maintenance required, mainly with filters and cleaning. Rearrange furniture to create more space to move around or to make room for additional storage and functionality. Rearranging furniture can also improve airflow around your home. Install extra cupboards for storage. Swap rooms around to increase accessibility; for example moving a laundry to a cupboard space that has access to outdoors or moving a study to an area that has lots of natural light. Creating a more energy efficient home is often about approaching it from a common sense perspective. If you’ve got the sun beating down through a window with no shade then your home will heat up and the energy required to cool your home down will increase. Some of the minor and low-cost things mentioned can be easily done and will surprise you when you see the impact they have on reducing your energy bills and home comfort. If you are embarking on renovations most of the actions we have mentioned here do not require Council approval. However, it is always sensible to check before making any changes. Next time we’re going to look at energy efficiency from the perspective of building an extension on your home. Here we will introduce the concept of passive design, look at passive design features and then delve into the actual design of your extension. It’s going to be great.